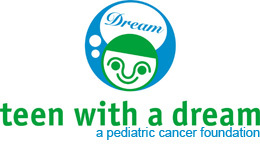 Teen with a Dream™ is a 501 (c) (3) charity founded specifically to enrich the lives of pediatric cancer patients and the lives of their families by combating the effects of social isolation and loneliness during chemotherapy through specialized social, educational, and financial programs. Teen with a Dream™ is one of the only national cancer charities founded specifically for children by a childhood cancer survivor. Diagnosed with Hodgkin’s Lymphoma, 14-year old Spencer Harrison spent most of 2003 fighting for his life. While the year was a tough one for both Spencer and his family, the 14-year-old chose to draw strength from his experience and help others undergoing the lonely, painful process of chemotherapy. So in 2004, Spencer founded Teen with a Dream™ a non-profit charity organization designed to better the lives of kids with cancer. To combat the effects of social isolation experienced by kids undergoing chemotherapy and provide them with friendship and comfort. Through the generous donations of our partners and sponsors, Teen With a Dream strives to ensure each child identified to us receives our signature Chemo-Day Care Packª on treatment day. These kits are filled with games and activities, candy to help alleviate the bad taste chemo can generate, cool hats for those coping with hair loss, gift cards, and other items to help children keep their minds off this very long and painful process. To facilitate parties and activities during the chemo treatment period to increase social interaction among kids. Teen With a Dream particularly wants to continue renting local movie theaters for the enjoyment of its immune compromised patients. To continue to reduce the anxiety of pediatric cancer centers visits by perpetuating more cheerful and inviting patient areas and help the transition into more “kid-friendly” environments with brightly colored walls, laptops and Internet access. To always stand firmly resolved that chemotherapy should not be a barrier to academic success nor merit-based scholarship. Again, with the generous support of our partners, we will continue to place laptop computers in pediatric cancer centers so students may continue a large portion of their education online. And through its growing scholarship program, enable affected students to continue their academic pursuits at the college level. You’ll find that at Teen with a Dream, the needs of our kids always come first. We are trusted, consistent and dependable partners for our kids, their families, and their medical care providers. And to us, that means active collaboration, consistent behavior, and punctual response to all queries. Teen with a Dream does not discriminate against individuals or groups based on age, political affiliation, race, national origin, gender, class, disability, sexual orientation or religious belief. We are accountable to our kids, their families and our partners as stated in our IRS 990s.